Philips adds 3D and LED to upgraded Platinum edition Cinema 21:9 TV | What Hi-Fi? Crucially, the new Platinum 58PFL9955 version is now 3D capable with a built-in 3D transmitter and it will come with one pair of 3D glasses. The set also gets a larger 58in screen and full LED Pro direct backlighting. 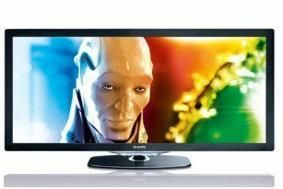 Other technical highlights include 400Hz Clear LCD, Perfect Pixel HD processing, Ambilight Spectra 3, built-in wi-fi and an Ethernet connection for accessing Philips Net TV. Philips claims the LED Pro backlighting, with an array of 2000 LEDs, "allows the darkest blacks and the brightest whites to be displayed in the same image". The new Bright Pro system is also said to reduce the problems caused by the 3D glasses blocking light from the TV, so giving a consistently bright image with both 2D and 3D material. And Philips's 400Hz Clear LCD system includes a scanning backlight to improve motion handling and reduce crosstalk when viewing 3D material. We'll be putting all this technology to the test in our January issue, on sale December 9th, when the Philips Platinum 58PFL9955 gets the full First Test treatment.